2:32pm: Maybin will earn $500K in 2012 with the money escalating each year, according to Corey Brock of MLB.com. The 24-year-old will earn $3MM, $5MM, $7MM, $8MM, and $9MM in years to follow. The final year of the deal, 2017, comes with a $1MM buyout. 11:11am: The Padres and Cameron Maybin have agreed to a five-year contract extension with an option for a sixth year, reports Scott Miller of CBSSports.com. Dan Hayes of The North County Times first reported that an extension was imminent earlier this morning. The Brian Goldberg client will get $25MM guaranteed, according to Corey Brock of MLB.com. The option is worth $7-8MM. The team has announced the deal. The five-year contract extension covers Maybin's final pre-arbitration season, all three seasons of arbitration-eligibility, and one free agent year with an option for second. Maybin did ask for a no-trade clause according to ESPN's Jerry Crasnick (on Twitter), but the team has a policy against them. Maybin, 24, enjoyed a breakout season in San Diego last summer after being acquired from the Marlins for Ryan Webb and Edward Mujica. He hit .264/.323/.393 with nine homers and 40 steals overall, but like most players he was much more productive away from Petco Park: .294/.349/.457 with seven homers. Maybin is also considered a strong defensive center fielder, ranking third at the position with a +9.5 UZR in 2011. The contract is similar to the one signed by Chris Young with the Diamondbacks back in 2008, a five-year deal worth $25.5MM that was brokered by current Padres GM Josh Byrnes. He had less than two years of service time at the time, however. Curtis Granderson ($30.25MM) also signed a five-year deal at a similar point in his career. Both Young and Granderson had a substantial advantage over Maybin in power numbers though, so it appears as though Goldberg got a nice deal for his defense-first outfielder. As our Extension Tracker shows, the Padres have not signed a player to an extension longer than three years since Adrian Gonzalez and Chris Young in April 2007. Jake Peavy signed a three-year, $52MM extension in December 2007 and Jason Bartlett signed a two-year, $11MM deal last January. The two sides had been talking about a long-term extension most of the offseason, though talks stalled early last month when Maybin changed agents. Ben Nicholson-Smith suggested that the five-year contract worth $21-22MM could work for both parties back in January. Good job Padres. We need more OFs like Maybin that fit Petco Park – good defense, speed, gap hitting, young and affordable. That’s a pretty reasonable deal. I’ve got to wonder if this makes the Nats more likely to give ’em a call and offer a top prospect or two in a deal to finally shore up their gaping hole in CF? The Pads could use some more prospects and the Nats are reaching the cusp of contention. I highly doubt the Padres signed Maybin so they could immediately turn around and trade him for a couple prospects. They’re trying to build around the guy. He’s young, still has room to improve, and now he’s controllable AND affordable for the next five years. I doubt he’s going anywhere any time soon. The Nats will probably have to cope with Roger Bernadina and Rick Ankiel in CF until the trade deadline. Keith Law just ranked Padres’ farm system as tops in bigs. I guess a team could always use more prospects, but at some point you have to start putting together bigger pieces. Maybin is as good fit for the rebuild in SD. what makes you think that the number #1 farm system “could use some more prospects? Padres have the best minor league system in baseball, and have depth in every position. Unless the prospect’s last name rhymes with Garper, Maybin’s here to stay. They don’t have depth at every position. They’re pretty light when it comes to legitimate SS prospects – as in, they probably have none. And outside of Corey Spangenberg, most of their 2B prospects are more likely to reach the big leagues as utility players, if they get there at all. I always felt that someone in the core of Cabrera, Parrino, Forsythe, and Darnell could assume the SS position well. I know that SS isn’t necessarily their original position, but its good enough to keep Padres from seeking SS prospects by trading someone like Maybin. Darnell barely has the athleticism to play 3B let alone SS. He will not be the Paders SS. Jace Peterson is a legitimate SS. He is a 3-4 years away, but he has all the tools. Jeudy Valdez is a decent prospect and would be a good ML backup. Before his injuries Everth Cabrera was considered the Padres SS of the future. He is still only 25 and is by no means out of the picture. James Darnell has a great shot at being a decent 2B and would be a very good 2B with the bat, although I think he ends up in the OF or being traded. Jonathan Galvez is a few years away, but he is a legitimate 2B prospect and projects as a MLB starter. Andy Parrino would be a contributor at the ML level as well. Vince Belnome is another that could contribute at the ML level. And dont forget Drew Cumberland. He lost a year, but he was one of the top prospects in the system and top 100 in MLB not too long ago. The Padres may not have a player that projects as an ALL STAR at SS or 2B in their system, but they have several prospects that do project as ML starters. Excellent contract. Very excited to see Maybin as (hopefully) the first major piece of San Diego’s resurgence. Padres fans have to be excited about this. Maybin should only continue to improve with his new-found job security. 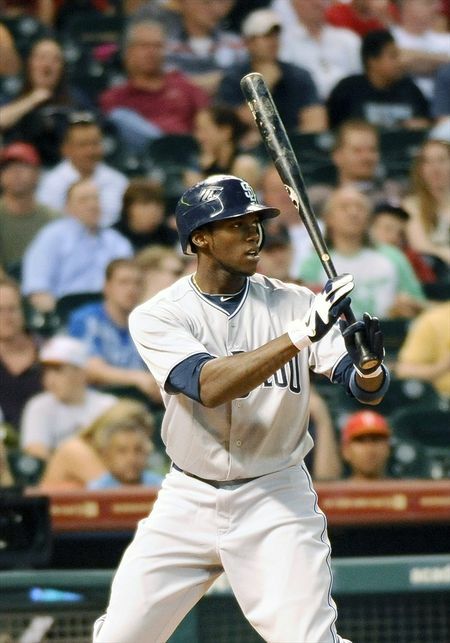 I think in time Maybin could prove to be a Mike Cameron type of player – gold glove quality defense, hit .260-.270ish, provide 20ish HR and supply plenty of speed. Hopefully he can improve his eye at the plate, cut back on the strike outs, and develop into a very good #2 or #3-type hitter with some maturity. I think Mike Cameron is a good comp, too bad Cameron was largely ignored most of his career even though he was a very good player. The Padres season ticket phone lines must be ringing off the hook. Yeah they are.And just like mother, if you call The Padres phone, you will get service. The comment disappeared for a while, but I gotta say I love this deal. It’s team friendly but it’s pretty much the ceiling for what Maybin’s production is worth. He gets paid, the Padres get a cheap and young talent for half a freaking decade- everybody’s happy! Side note on this extension: Cameron Maybin had been represented by the Baratta brothers. It was recently reported he left them in favor of Brian Goldberg of mgmt one. Only reason I say this is the Baratta brothers were the agents who filed a grievance against Andy Oliver following him not signing with the Twins in the 2006 Draft (Oliver is now with Boras) which resulted in Oliver losing his NCAA eligibility for the 2008 season. Great job padres…. who is next to lock up? I’d vote for Cory Leubke. After that, I’m not sure anyone on the current 25-man. Grandal, Gyorko, and some of the young pitching (Erlin, Wieland, Kelly) would be next on my priority list once they get called up. Padres are unlikely to sign a pitcher to a long term deal. I think headley or hundley could be next in line to get an extension, although both could also be trade bait since they have replacements at the upper minors. The padres have a myriad of third base prospects. I think they may rather swap him for something more valuable. I agree. Headley will be/should be dealt at the deadline this season. With Gyorko raking the way he has since he signed, he should be ready for a cameo at the end of the year. Unless the Padres are in contention , which they could be, Byrnes should be looking to see what he can get for Headley. Hopefully Quentin will have a solid year and they can sign him to a 3 year extension mid-way through the season. I would love for the Padres to package up Blanks and Darnell and get a couple of more pieces to the puzzle, barring what they nab in the draft. We REALLY need a SS. I like Weiland and Erlin, but I would have LOVED to have gotten Profar from Tx for Adams. Even though Cashner has looked great so far this spring, it would have been great if the Padres could have gotten a SS for Rizzo. I really thought a Rizzo to Tampa Bay for Lee deal would have been a win for both teams. If you look around the league, there are very few true SS prospects out there at all, let alone available. You would have to think that Machado, Profar(not sure why with Andrus being in Texas), Lindor and apparently Lee are untouchable. When the Padres made the Latos deal, I was relly hoping that Hamilton was coming back in return. One player that may be available, because he is blocked by Machado, is Jonathan Schoop of the Orioles. He is a few years away from the Majors, but from what I have read he has all the intangibles to be a SS in the Majors. I’m not sure what Baltimore would want back in return, but Byrnes should at least make a call. Oh yeah, I still have hope for Cabrera. He is still relatively young and played quite well last season before his injury. I read somewhere that the Rays weren’t terribly high on Rizzo. I was hoping for a Lee return as well. By mid-season I wouldn’t be surprised if all of a sudden we’re talking about Cabrera at SS again. Back in ’09 he only struck out 20% of the time with the Padres, while hitting .276/.368/.382 outside of Petco. Pretty impressive for a guy making the jump from A-ball. In AAA he struck out 14.7% of the time last year. At both of those stops he walked 10.5% of the time. Point being, our best bet at SS might very well be the guy we already have. As far as SS targets, I could see the Padres holding out for someone that isn’t 2+ years away if they’re addressing the position long-term by giving up a valued trade piece. There haven’t been a ton of guys to target, something of a drought. It is interesting that the Padres potentially could have had Jed Lowrie, Jose Igleisias & Billy Hamilton in the Gonzalez and Latos deals. I know I’d rather have Alonso or Grandal over Hamilton. Good ceiligs and seemingly much safer bets to live up to their potential. Iglesias inclusion would have likely meant one of Kelly or Rizzo wasn’t in the deal. On paper Lee for Rizzo seemed to make way too much sense. From the Rays perspective they seemed much more likely to move Davis or Niemann for a bat. They can clearly spare pitching more then a high upside SS that could be their everyday guy in 2014. For a team trying to compete in 2012, can’t blame them for signing a guy like Carlos Pena on a 1-year deal rather then going with a rookie. If a team had an opening at 1b each year, filling that hole with a 1 year free agent isn’t a bad route. As I said, I’m still holding out hope for Cabrera and Byrnes seems to have a lot more faith in him than Hoyer had. If Cabrera does end up getting some substantial playing time, he should have a lot longer leash than he had the last 2 seasons. If Cabrera can hit .260 with 30 steals, probably more if he can stay healthy, he could play SS for my team any day. Their only problem now is Bartletts’ contract, because if the Padres want to move him they will have to play him to create a market. I personally would rather the Padres just eat Hudsons’ contract and play Cabrera at 2nd this year and then move him to SS if all goes well next season. I know that may not make a whole lot of sense, but I just can’t stand Hudson. I didn’t like the deal when they signed him, reason being there has to be something behind him jumping from team to team on nearly a yearly basis. He plays it up lik ehe is such a great teammate, but his actions last season were to the contrary. He seems like such a phony. Any way, sorry about the rant, Go Padres. As a ranger fan. I can tell you the rangers would never trade a Profar, top tier SS are hard to come by. The rangers will keep him an either move Kinsler into a role like Michael Young is in or trade him an make either elvis or profar the second baseman. Kinsler is 31 an by time Profar reaches the bigs Young will more then likely be retired an kinsler ready for that role. I find it very interesting that Maybin asked for a no-trade clause and that the Padres wouldn’t give him one. I realize the Padres have a policy of not giving them, but when you find an offensive player who wants to play at Petco, I think he would be an exception to the rule. By giving him a 5 year extension, you would think that the Padres brass thinks he will improve on his first full season in the Majors, that went quite well if you ask me. I guess if the farm system starts graduating players to the big league club as expected, then the no-trade clause should be a moot point because the Padres will be contending yearly. Lets hope Padres fans. I wouldn’t give a guy four years from free-agency a full no-trade clause. Really bad precedent to start. I realize it would have been quite the add on, the no-trade clause, but finding a hitter that wants to stay in San Diego and is just scratching the surface of his potential could be an exception. The Padre organization hasn’t really shown a willingness to lock up young players, or any loyalty at all as of late, so showing their players and fans that they are finally ready to put a good product on the field for a prolonged period of time would have been a great move for the club house as well as a good PR move. I know you can’t run a franchise trying to appease your fans, but even without the no-trade clause this should shut up some of the nay sayers for awhile. I’m really looking forward to watching this team grow the next few years and hope that there is a World Series run for the Padres in the near future. Go Padres. But they got him signed without having to give him a NT clause, isn’t that like having your cake and eating it too? Is the issue with the Padres unwillingness to lock up young players something other than not having the talent to justify those moves? I was expecting an overpay by the Pads but this is a solid deal. An overpay by the Pads? Now that would be funny.